NEW: Level 6 and Pre-Level 6 BSL Courses for September 2019! This week is The British Deaf Association’s ‘Sign Language Week 2019’, and Dot Sign language are extremely excited to announce that we will be teaching two advanced level British Sign Language courses running from September 2019 – July 2020. 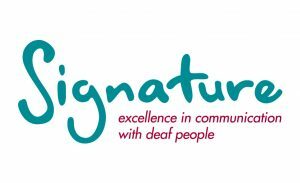 Signature have completely updated the BSL Level 6 qualification. Focusing on fluent BSL skills and knowledge of Deaf culture, students will be learn to use and understand complex BSL in all types of social and professional interactions. Topics covered will include medicine, education, employment and business, finance, politics and law, society, media, science and technology. Upon successful completion of this qualification, learners will be able to demonstrate language skills equivalent to an undergraduate degree in Modern Languages. If they wish they can then progress to interpreter training. Please attend our information day or arrange a meeting so Kathleen can assess your signing through an informal conversation and advise which course is better for you. Click the links to see individual course pages including full information regarding timetables and pricing.